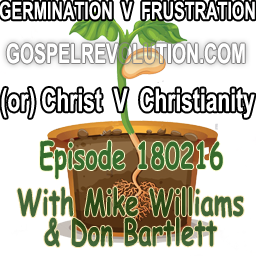 This week Mike and Don address a Bible verse, which in Christianity generally, and in Word of Faith (Pentecostal) denominations specifically, has been mistaught, manipulated and misapplied. Does the Bible actually say, “If you had faith as small as a mustard seed”? Well does it? You may be surprised at the real meaning of Jesus’ words, when read without filters and in context. Also addresses were the topics of how to teach children the Gospel, how discovering www.gospelrevolution.com felt to a newcomer, Gloria Copelands instructions to totally disregard doctors advice, how one Alabama pastor suggested lining up students and shooting them plus much more. We also heard from Shean Smith, Rob Vacanti, David Freeman and others. I used to be a part of the Word of Faith movement, but no longer am simply because I have seen far too much inaccuracy with the Word. And…I agree, joyfully, with many things that Mike teaches. However, I would like to take issue with some of the hyperbole saying that Andrew Wommach, etc. never admitting any failures. That simply is not true, therefore, it ‘weakens’ and argument when points are overstated. I have heard, with my own ears, some of the leading ‘faith teachers’ admit their failures. State truth, but please watch the hyperbole. There’s no need for it.